Talk about inspiration! 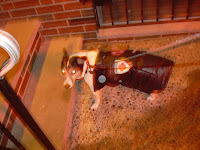 I realized I now have a photo collection of dogs in coats and garb to share. You start taking one photo, and 20 photos later, you have a set. These are some of the best and brightest stars of Center City I've spotted over the past few weeks. George, from the suburbs. He is sporting his hand knit sweater. 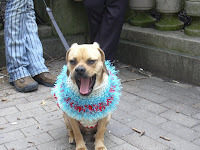 He garnered a lot of attention in Rittenhouse Square. 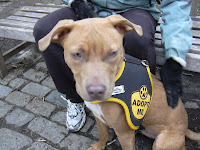 Nyla, a dog up for adoption by PhillyPaws. 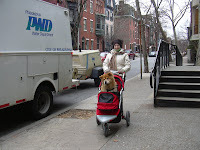 The group was in Rittenhouse Square on Sunday, Feb 17th, with many dogs. Nyla was the sweetest with amazingly beautiful eyes. Kraymbau - a sweet old Chow and her owner, Daniella. Kraymbau has a touch of arthritis, and Daniella takes her out in her carriage for a daily stroll to Rittenhouse Square. 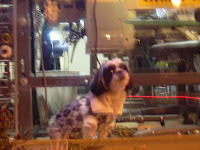 Dog in a Taylor Shop window. I think I may have posted it before. The taylor shop has a selection of dog clothes on display, probably for sale, but also to show their expertise. Hamlet in his Old Navy "Leather Bomber" Jacket. One of the few times he relented to wearing it. 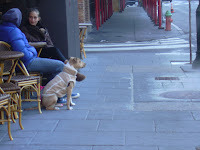 Elegant Dog in a Shearling Coat outside of Rouge - Rittenhouse Square. To view more of my collected dog photos as well as other great pictures, visit my Flickr site - located under Neenyd03, or click on my photo link to the right of the blog.